Dario Franchitti seized control of an engrossing Iowa Corn Indy 250 with 50 laps to go and closed out a win that leaves him just three points off the series lead. Heavy attrition in the early stages knocked seven of the 20 runners out of the race, with only half of the first 64 laps being run at full pace because of cautions. 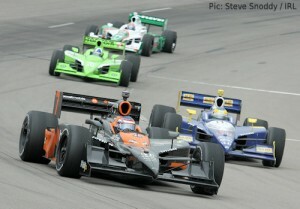 The highest-profile casualty was Tony Kanaan, who pitted from the lead and crashed soon after rejoining. But Kanaan’s lap 123 caution was the last of the race and the fast-paced 7/8mile Iowa Speedway went some way towards repairing the IRL’s recently-damaged reputation for overtaking and side-by-side racing with 12 lead changes taking place between seven different drivers. Helio Castroneves had been handed pole position based on car entry points after water on the track forced the cancellation of qualifying, but his lead lasted only until lap 16 when Scott Dixon overtook him and the two cars touched. They survived to finish seventh and fifth, but neither led the race again. Franchitti said: “The car wasn’t great and the Target guys made a couple of adjustments for that last stop – and that was a green flag stop. That was really the key. Good in-lap, good out-lap on cold tyres and amazing pit stops. Hideki Mutoh, last year’s runner-up, took third and was followed home by the 2008 winner Dan Wheldon. The Panther driver took another step forward in his fight to drag his team back into contention by leading eight laps. He said: “To finish fourth here with this level of competition is something we can build on. There’s a bunch of good guys on this Panther team and they’re all working very hard and I know we all want to get back to victory lane together. “I always tended to lose a few places on starts and restarts but once the car came in it was as good as anybody out there. Towards the end of the race I should have made some more aggressive changes with the front wing because I had some understeer. “This is a good track, as it starts to lose even more grip it’s going to become even more fun. Another driver continuing a steady improvement was Dreyer & Reinbold’s English rookie Mike Conway, who ran as high as second place and recorded his best-ever finish of eighth. He said: “It was a tough race. We started from the back with what happened with qualifying yesterday. We kept it steady at the start, but even when you are trying to stay out of trouble and everything is happening around you, it makes it difficult. Justin Wilson had less luck, a jammed front roll bar making his car difficult to handle on the bumpy circuit and eventually causing the crash that knocked him out of the race on lap 34. Categorised under IndyCar Series, tagged under Dan Wheldon, Dario Franchitti, IndyCar Series, Iowa Corn Indy 250, Justin Wilson, Mike Conway, Ryan Briscoe.